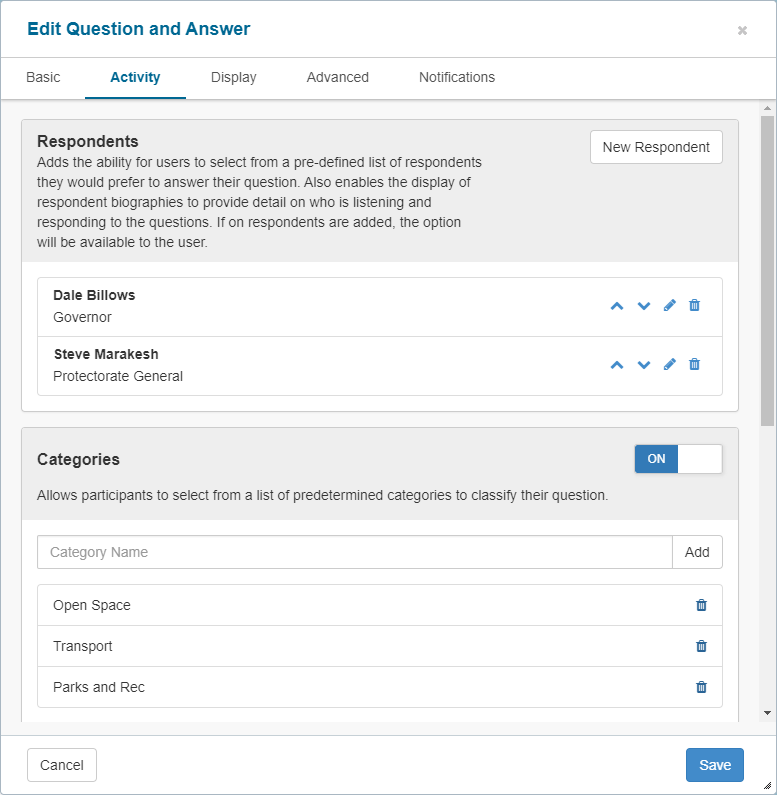 Version 2.12 introduces the Gather and Question & Answer tools, two dynamic new ways for visitors to engage. This upgrade also brings improvements to the Form tool so the 'Rank Field' question type looks and works better on mobile devices. Gather allows people to leave more than just text. They can respond to your call to action with pictures, videos and longform comments. You can add custom categories so responses can be filtered and sorted. Other visitors can leave comments on responses or 'like' them, allowing people to vote for, or respond to ideas, comments or proposals. 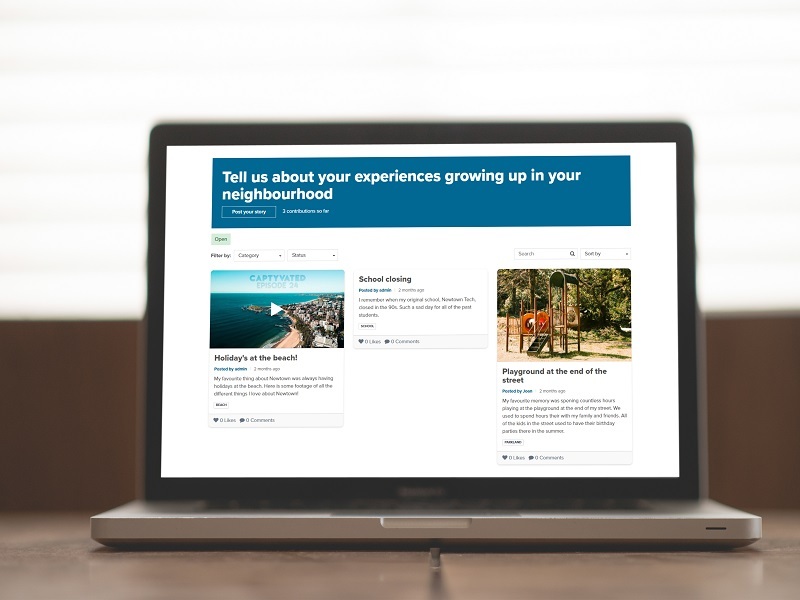 The Gather tool has a multitude of applications, from creating competitions to collecting rich qualitative data about people's lives, interests, favourite places and ideas for the future. Once you’ve added Gather to your page, you’ll be presented with a range of options. 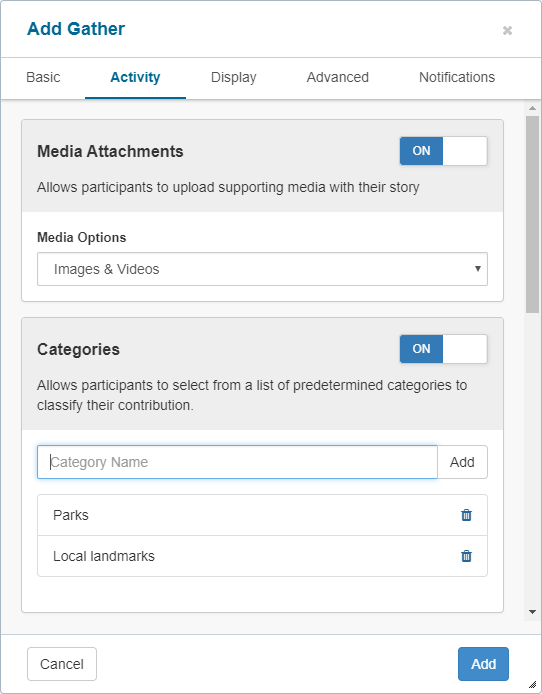 You can choose what kind of media your visitors can upload, create custom categories so people can filter the results (a useful feature for reporting too), and turn voting and comments on or off. 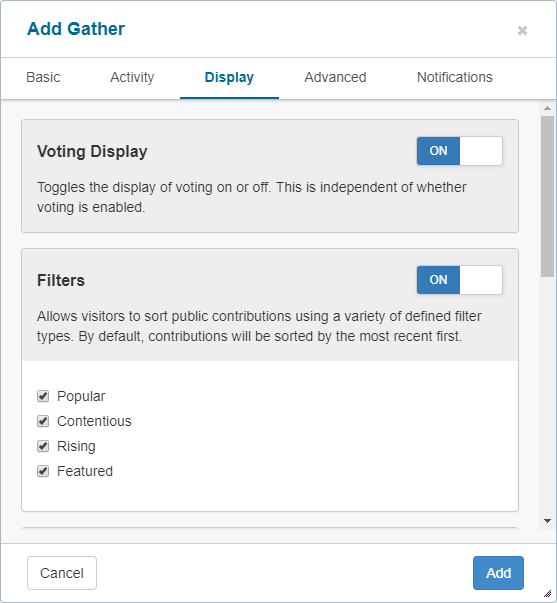 You can also select whether the voting results are visible to visitors and choose to display the results according to whether they are popular, contentious, rising or featured. 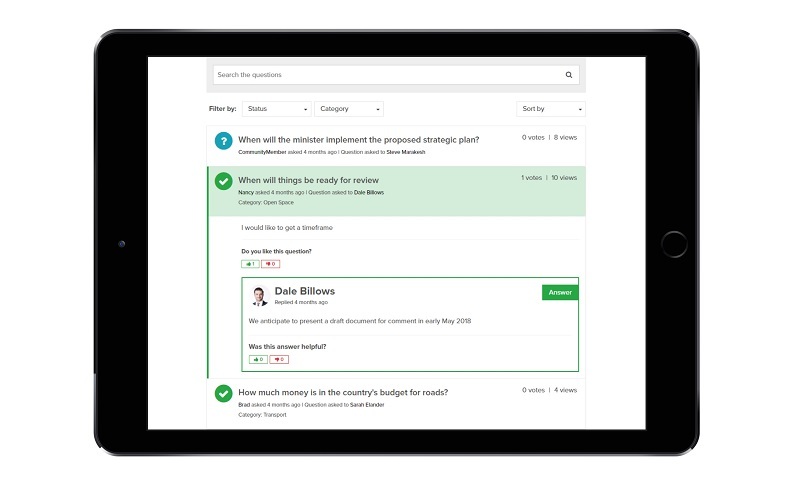 Question & Answer is a powerful tool that allows users to ask detailed questions and receive official answers. It empowers users to reach out and engage with your project and allows you to position your organisation as responsive, informed and authoritative. Rather than responding with a faceless official account, you can post responses from official representatives, each of which can have their own profile and avatar. Show the community you are listening by connecting with them directly. Adding the Question & Answer tool to your page gives you a range of options. Create profiles with avatars for the team members answering questions, add categories and choose whether or not to allow visitors to vote for questions, allowing you see what the hot-button questions really are for your audience. Question and Answer is also a useful tool for gauging community sentiment and finding out what information your audience really needs to know. You can moderate questions too, so you’re always in control of the conversation.